Councillor Gwenda Allgood, recipient of the inaugural Renewable Energy Champion award. Ararat Councillor Gwenda Allgood received the inaugural Renewable Energy Champion Award at the Melbourne Sustainable Living Festival 2014. Yes 2 Renewables selected councillor Allgood to recognise her efforts educating Australians about wind energy. Councillor Allgood has travelled far and wide to tell a positive story about wind energy. 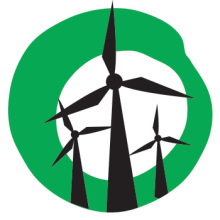 She has corrected the misinformation surrounding wind energy and encourages people to consider its benefits. In 2013, Cr Allgood travelled to King Island and Seymour to speak with communities who were considering wind farm proposals. Cr Allgood put Ararat on the national agenda speaking alongside federal politicians Yvetter D’Arth MP, Sen Christine Milne and Tony Windsor MP at the Rally for Renewables in Canberra. Around 1000 people gathered in support of wind farms and the national Renewable Energy Target. Drawing on her experience with the Challicum Hills wind farm, Gwenda reminds people that wind farms are clean and safe. They create jobs and drought-proof income for farmers while helping us address climate change. Author and former ABC Catalyst reporter Tanya Ha presented the award at the Melbourne Sustainable Living Festival. We need more councillors like this lady!